Please enter a valid street address and zip code. Please enter a valid street address, zip code, and email address. Please enter a valid street address and email address. Please enter a valid zip code and email address. We bring Fiber all the way to your home. This can take time. We can’t bring Fiber to everyone at once, so we build in phases. More areas will be opening in the coming months. Check your address to see if sign-ups are open in your area. 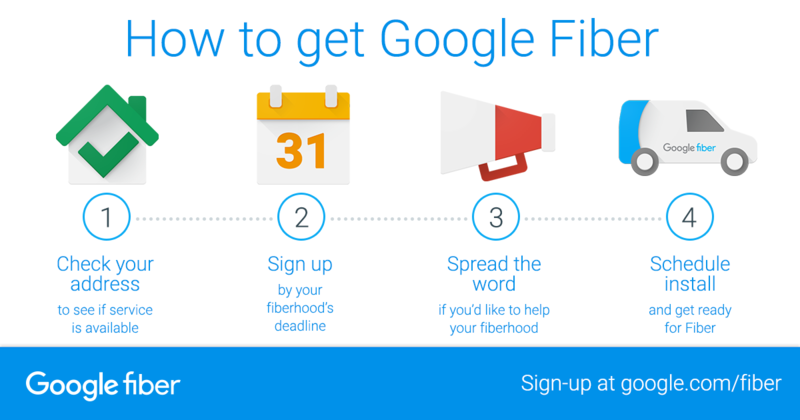 If not, we’ll make sure you’re among the first to know when we are coming to your fiberhood. A Fiber neighborhood. A community of homes, apartments, condos, and small businesses grouped together to help us better coordinate construction and installations for you and your neighbors. We don't currently have plans to return to fiberhoods once their sign-up periods have ended. Sign up now so you don't miss out. If you live in a single family home, we’ll complete the construction process by laying our fiber all the way to your home. This can sometimes take up to several weeks. If you’re in an apartment or condo that’s connected to the Fiber network, you don’t have to wait. You can schedule your installation appointment after signing up. Once construction is complete, we’ll get in touch to schedule your installation. Keep an eye out for emails from us with updates.